For the town in Germany, see Linz am Rhein. For the New Zealand government agency, see Land Information New Zealand. Linz is the third-largest city of Austria and capital of the state of Upper Austria (German: Oberösterreich). It is located in the north centre of Austria, approximately 30 km south of the Czech border, on both sides of the river Danube. The population of the city is 189,284 (2009), and that of the Greater Linz conurbation is 271,000. The Pöstlingberg church in Linz. The city was founded by the Romans, who called it Lentia. The name Linz was first recorded in 799 AD, after Bavarians expanded south and Linz became a center of trade. It was a provincial and local government city of the Holy Roman Empire, and an important trading point connecting several routes, on either side of the river Danube from the East to the West and Bohemia and Poland from north to the Balkans and Italy to the south. Being the city where the Habsburg Emperor Friedrich III spent his last years, it was, for a short period of time, the most important city in the empire. It lost its status to Vienna and Prague after the death of the Emperor in 1493. One important inhabitant of the city was Johannes Kepler, who spent several years of his life in the city studying mathematics. He discovered, on 15 May 1618, the distance-cubed-over-time-squared — or 'third' — law of planetary motion. The local public university, Johannes Kepler University, is named for him. Another famous citizen was Anton Bruckner, who spent the years between 1855 and 1868 working as a local composer and church organist in the city. The local concert hall "Brucknerhaus" and a local private music and arts university are named after him. Adolf Hitler was born in the border town of Braunau am Inn but moved to Linz in his childhood. Hitler spent most of his youth in the Linz area, from 1898 until 1907, when he left for Vienna. The family lived first in the village of Leonding on the outskirts of town, and then in an apartment on the Humboldtstrasse in Linz itself. Hitler's parents are buried in Leonding. After elementary education in Leonding, Hitler was enrolled in the Realschule (school) in Linz, as was the philosopher Ludwig Wittgenstein. Notorious Holocaust architect Adolf Eichmann also spent his youth in Linz. The association of the city with Hitler's childhood warranted an allusion in a poem by W.H. Auden, September 1, 1939: "Accurate scholarship can/Unearth the whole offense/ From Luther until now/ That has driven a culture mad, Find what occurred at Linz...."
To the end of his life, Hitler considered Linz to be his "home town", and envisioned extensive architectural schemes for it, wanting it to become the main cultural centre of the Third Reich. In order to make the city economically vibrant, Hitler initiated a major industrialization of Linz shortly before, and during, World War II. Many factories were dismantled in the newly-acquired Czechoslovakia and then reassembled in Linz, including the Hermann-Göring-Werke (now voestalpine). In addition to an ordnance depot, Linz has a benzol (oil) plant which was bombed during the Oil Campaign on 16 October 1944. The Mauthausen-Gusen, located near Linz, were the last Nazi concentration camps to be liberated by the Allies. While in operation, they were the source of quarrying for stone for Hitler's prestige projects across the Reich. The main camp in Mauthausen is just 25 kilometres (16 mi) away from Linz. After the war, the river Danube that runs through Linz — from the western side to the south-eastern side — which separates the Urfahr district in the north from the rest of Linz — served as the border between the Russian and American occupation troops. The Nibelungen bridge that spans the Danube river from the Hauptplatz (main square) was at that time Linz's version of Checkpoint Charlie. The Nibelungen Brücke with the two bridge head buildings is the only architectural plan Hitler ever carried out in Linz. The agglomeration includes (parts of) 13 other municipalities with together 271,000 inhabitants. Linz is also part of the Linz-Wels-Steyr metropolitan area of Upper Austria, home to around one third of the state's population (460,000 people) and second-largest urban area in Austria. Linz is an industrial city. The Voestalpine AG is a large steel concern (founded as the "Hermann Göring Werke" during World War II), and which is known for the LD- ("Linz-Donawitz") procedure for the production of steel, and the former "Chemie Linz" chemical group, which has been split up into several companies. This has made Linz one of Austria's most important economic centres. Linz is also the home of Pez ( makers of peppermint candy). Linz also serves as an important transportation hub for the region of both Upper Austria and, to a lesser degree, southern Bohemia. The "Blue Danube" Linz Airport lies about 6.25 miles (10 km) southwest of the town centre. Direct flights include Frankfurt, Düsseldorf and Vienna with additional seasonal routes added during the summer and winter months. Ryanair flies to London Stansted Airport. The city lies on Austria's main rail axis, the so-called "Westbahn", linking Vienna with western Austria, Germany and Switzerland. There are also varying types of river transport on the Danube; from industrial barges to tourist cruise ships. The main street "Landstraße" leads from the "Blumauerplatz" to the main square. In the middle of this square the high "Pestsäule" ("plague column", also known as "Dreifaltigkeitssäule" (Dreifaltigkeit means Holy Trinity)) was built to remember the people who died in the plague epidemics. Near the castle, being the former seat of Friedrich the III — the oldest Austrian church is located: Sankt/Saint Martins church. It was built during early medieval Carolingian times. Brucknerhaus — the concert hall named after the composer Anton Bruckner, who was born in Ansfelden, a small town next to Linz. Gugl Stadium, is home to the LASK (Linzer Athletik Sport Klub), which is claimed to be the third oldest soccer club in Austria. The city is now home to a vibrant music and arts scene that is well-funded by the city and the state of Upper Austria. Between the Lentos Art Museum and the "Brucknerhaus", is the "Donaulände", which is also referred to as "Kulturmeile" ("culture mile"). This is a park alongside the river, which is used mainly by young people to relax and meet in summer. It is also used for the Ars Electronica Festival and the "Linz Fest". Linz has other culture institutions, such as the Posthof, which is near the harbour, and the Stadtwerkstatt, which is by the Danube river. Linz is the European Capital of Culture in 2009, along with Vilnius, the capital of Lithuania. The recently built Lentos (2003) is a modern art gallery, presenting art from the 20th and 21st centuries. It is situated on the south banks of the river Danube. The building can be illuminated at night from the inside with blue, pink, red, and violet, due to its glass casing. The Ars Electronica Center (AEC) is a museum and research facility on the north bank of the Danube (in the Urfahr district), across the river from the Hauptplatz (main square). The AEC is a significant world center for new media arts, attracting a large gathering of technologically-oriented artists every year for the Ars Electronica festival. The AEC museum is home to one of the few public 3D CAVEs in Europe. 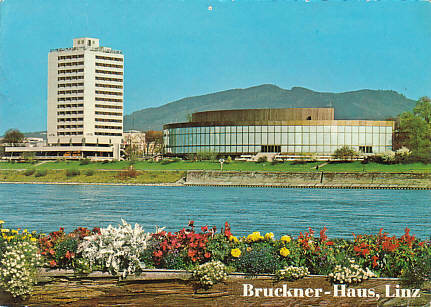 The Brucknerhaus, the most important concert hall in Linz is named after Anton Bruckner. It is situated just some 200 meters away from the "Lentos". It is home to the "Bruckner Orchestra", and is frequently used for concerts, as well as Balls and other events. Wolfgang Amadeus Mozart wrote his Symphony No. 36 (1783) in Linz for a concert to be given there, and the work is known today as the Linz Symphony. The first version of Anton Bruckner's Symphony No. 1 in C minor is known as the Linz version. Catholic-Theological Private University Linz (private) for Catholic theology (approx. 400 students), which has been a Papal faculty since 1978. Amongst the many "Gymnasien" (high schools) in Linz, is Linz International School Auhof (LISA), which is one of four IB (International Baccalaureate) schools in Austria, and uses English as main language for instruction. Andrew Edge (born in Leeds, England) musician. Doug Hammond (born in Tampa, Florida, 1942) musician. Klaus von Pervulesko (born in Innsbruck, 1945) actor. ^ Paul Hofmann (1987-04-05). "Letting Linz Castle cast a spell". The New York Times. http://query.nytimes.com/gst/fullpage.html?sec=travel&res=9B0DEED9163BF936A35757C0A961948260&scp=5. Retrieved 2008-12-02. ^ "Linz City Travel Guide". About Austria. http://www.aboutaustria.org/capitals/linz.htm. Retrieved 2008-04-15. ^ Lundy, Darryl. "A genealogical survey of the peerage of Britain as well as the royal families of Europe". The Peerage. http://www.thepeerage.com/p11357.htm#i113570. Retrieved 2008-04-15. ^ "St. Martin's Church, Linz (in English)". Linz City Tourist Board. http://www.linz.at/english/Tourism/1146.asp. Retrieved 2008-04-06. ^ "Mariendom (New Cathedral in Linz)". Mariendom. http://www.dioezese-linz.at/redaktion/index.php?page_new=2500. Retrieved 2008-04-06. ^ "LASK". LASK. http://lask.at/content/lask/home/startseite/index_ger.html. Retrieved 2008-04-06. ^ George Tabori. "Mein Kampf: Farce in fünf Akten" (in German). Landestheater. http://www.landestheater-linz.at/490_DE-Stuecke-Stueckinfo.htm?stueckid=173. Retrieved 2008-04-06. ^ "Die Spielzeit 2007/2008". Landestheater. http://www.landestheater-linz.at/257_DE. Retrieved 2008-04-06. ^ "Welcome Posthof 04 2008". Posthof. http://www.posthof.at/. Retrieved 2008-04-06. ^ "Stadtwerkstadt". Stadtwerkstadt. http://www.servus.at/stwst/. Retrieved 2008-04-06. ^ "European Capital of Culture". Linz Tourist Board. http://www.linz09.at/en/index.html. Retrieved 2008-04-06. ^ "Fred Astaire (1899–1987) aka Frederick Austerlitz". Hyde Flippo. http://www.germanhollywood.com/astaire.html#pop4. Retrieved 2008-08-24. ^ "Andrew Edge". Andrew Edge. http://www.andrewedge.com/. Retrieved 2008-04-06. ^ "Doug Hammond biog". Doug Hammond. http://www.doughammond.org/. Retrieved 2008-04-06. ^ Sulzer, Balduin. "Das musikalische Nashorn" (in German). Gerhard Brössner. http://www.ooejo.eduhi.at/Freiberufliches/Das%20musikalische%20Nashorn/Das%20musikalische%20Nashorn.htm. Retrieved 2008-04-06.